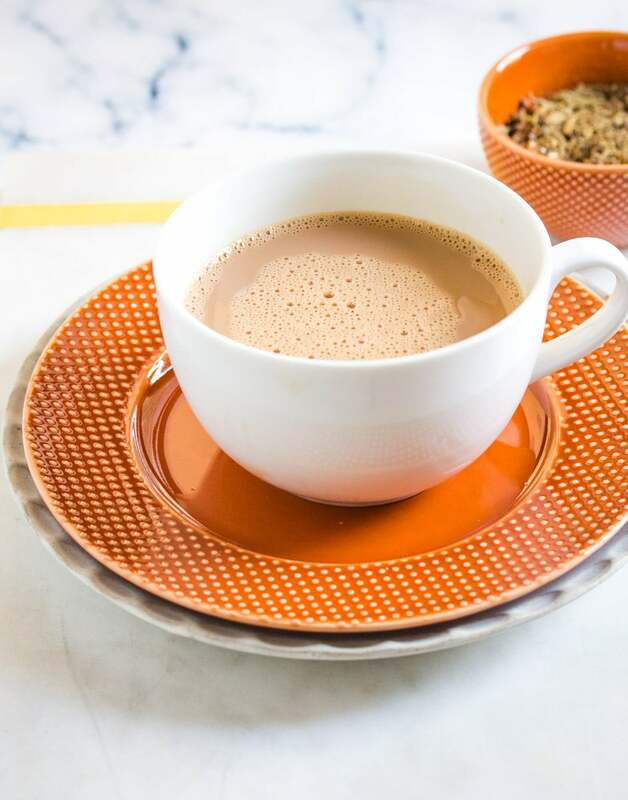 Masala Chai Recipe (aka Indian Spiced Tea) is a soothing and warm tea made with milk and Indian spices, such as cardamom and ginger. It’s perfectly soul soothing, and goes so well with these Baked Spinach and Cheese Samosa! So, it’s finally a little cold here in the Middle East. Not cold by the rest of the world’s standards, but its cold for us because we’re so used to living in a crazy hot climate. Now people who know me well, would know that I’m not a tea person because coffee will always be my first love. 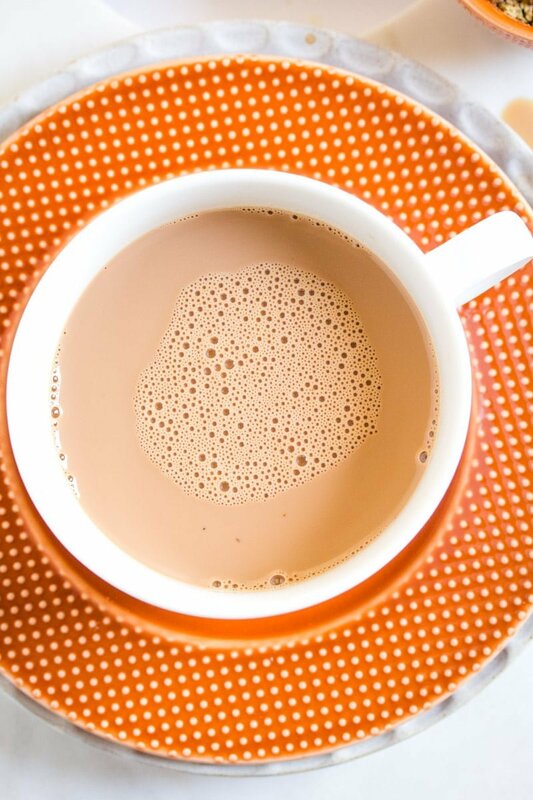 But there are days when I do want a cup of chai, and I like to try different kinds of chai recipes all the time. 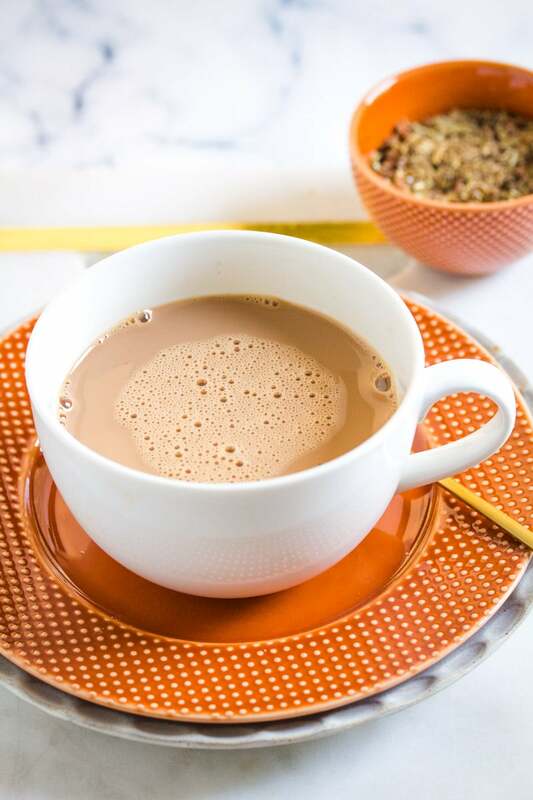 My favourite chai recipe has to be this Karak Chai, but I also really love this Homemade Chai Recipe which is milky and super comforting. 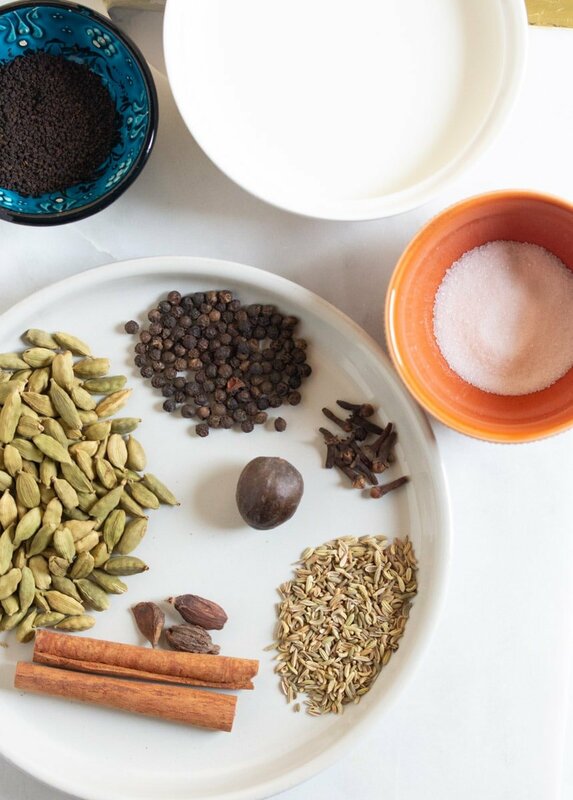 For special occasions however, I love to make this Masala Chai recipe. It’s a pretty simple recipe, but it’s quite delicious with a hint of Indian spices. So What Spices are used in Masala Chai? However, I know that lot of people use fennel seeds (saunf) and clove (laung or lavang) in their masala chai. But if you’ve been reading my blog for awhile, you know that I like to keep things pretty simple. So I don’t use these spices, and I feel my Masala Chai recipe is still pretty delicious. 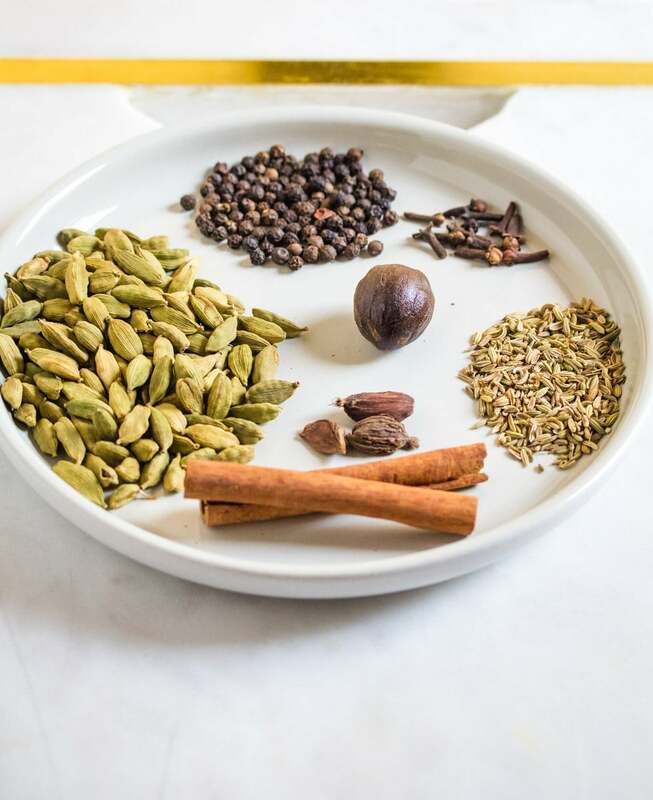 How Do You Make Masala Chai Recipe? Making Masala Chai is super easy!!! But I’ll still walk you through the steps. Start by crushing the spices in a pestel and mortar. If you don’t have a pestel and mortar, you can even skip this step. Then bring the water to a boil in a saucepan, and add the spices. Let the spices infuse in the boiling water for a few minutes. Now add the tea leaves. If you don’t have loose tea leaves, then just cut open tea bags and use the tea leaves. Cook the tea for another 2-3 minutes and then add the milk and let it cook for another 2-3 minutes. Pour the tea through a tea strainer into mugs and serve immediately with your choice of snacks. I personally like to have my Masala Chai with Cake Rusk or these delicious melt in your mouth Butter Cookies. Note: For the full recipe, please scroll down to the recipe card. 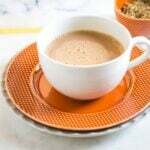 Masala Chai Recipe (aka Indian Spiced Tea) is a soothing and warm tea made with milk and Indian spices. In a mortar and pestle, coarsely crush the spices. Set aside. In a small saucepan, boil the water and add the crushed spices. Boil for about 2-3 minutes. Add sugar and the tea leaves. Cook for another 2 to 3 minutes. If you want your tea not to be too strong, then boil for only a minute or so. Add the milk and boil for another 2 to 3 minutes. Pour the tea into mugs using a tea strainer.